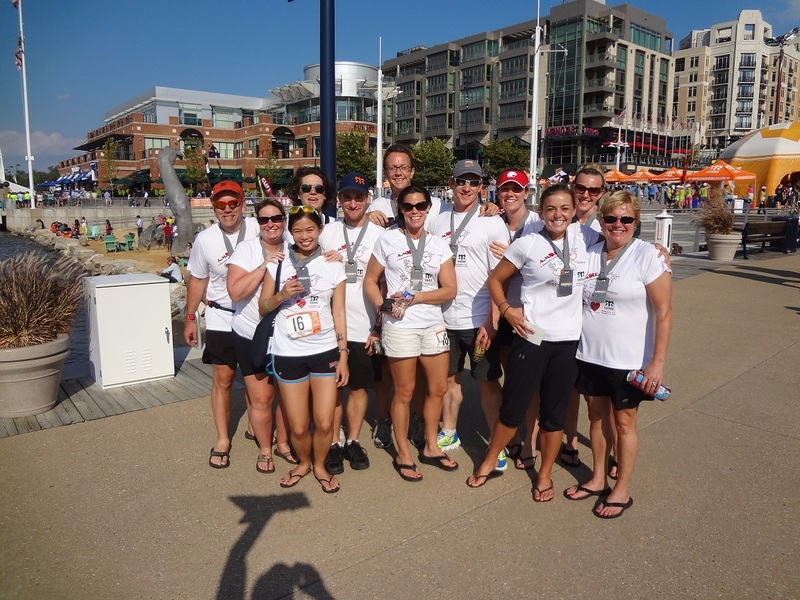 I did my second Ragnar Relay of this year–the Ragnar DC!! Earlier this year, I was on the NYC Bridgerunners team for Ragnar Cape Cod and I was itching to do one in the fall. Luckily, my fabulous friend Diane decided to captain Team A.M.O.R.E (A Mismatch of Running Enthusiasts) once again so I had to join! One reason why I love relay races is because it makes running a team sport. Running can be a lonely and solitary activity when you’re training, but you find a good race and that all changes. Diane and I met randomly when she signed on to be a last-minute substitute for our Ragnar NY team last year. We hit it off and kept in touch ever since! I arrived in DC at 11pm on Thursday evening, got to Diane’s house by midnight, and then only got two hours of sleep before my 3am wake-up call. 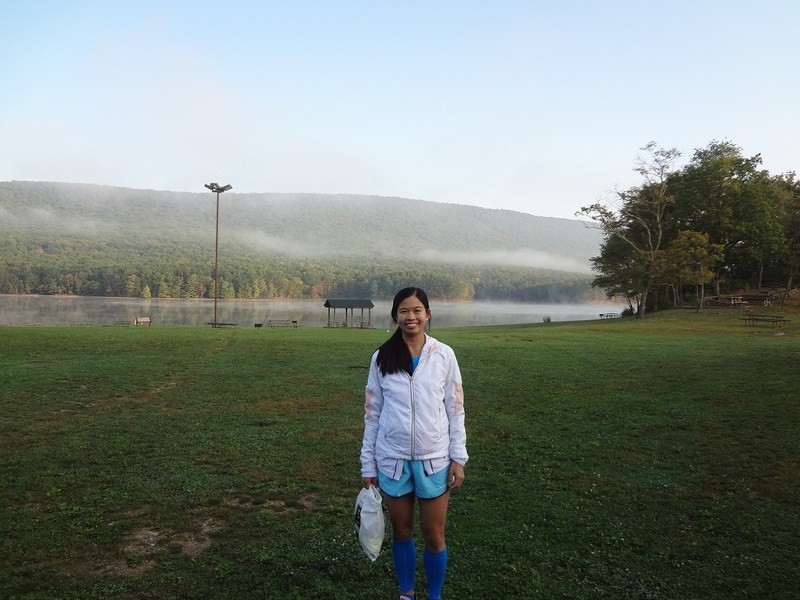 We had to drive 2.5 hours from Burke, VA to the start line at Rocky Gap state park. I was in Van 1 with Catherine, Krissy, Diane, Deb and Shannon. Lucky Van 2 got to sleep in! It was so early that I didn’t get to meet the rest of my van mates for two hours because they were sleeping on the way to Rocky Gap State Park, lol! Diane was a trooper and drove us there, while I navigated a little bit and then had to nap for 30 minutes. We got to the start, had our safety briefing, shopped for some Ragnar gear, and then saw Shannon start us off at 7:30am. Woohoo! The scenery in Rocky Gap State Park was stunning. 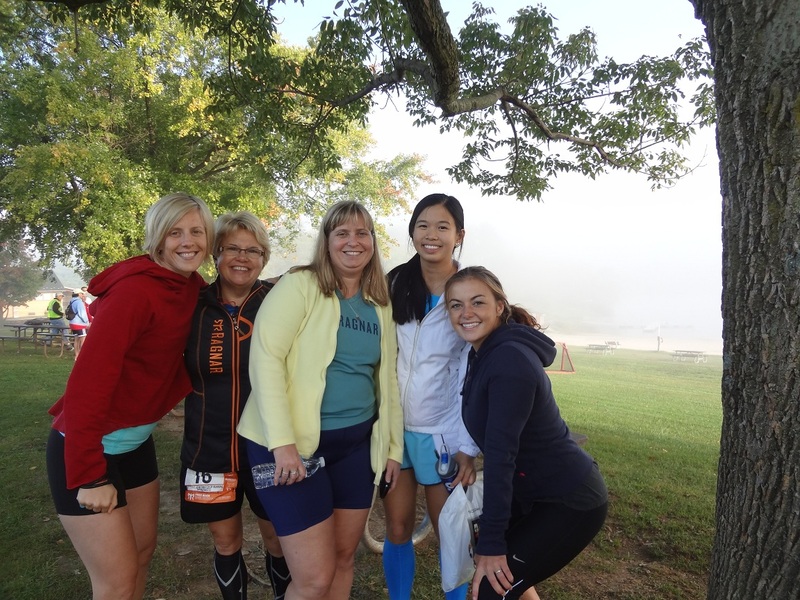 There was early morning fog and mist, and the runners ran a 5 mile loop on trail and quaint bridges. In the Ragnar Relay, there are 12 runners in 2 vans and you “leapfrog” the runner, dropping them off at exchange points and picking them up to rest so that one runner is on the road at all times. My biggest fear was getting lost, but since I’ve run in the same relay position (runner 6) of the Ragnar DC before, I knew it was unlikely. The weather was gorgeous and I was thrilled to be doing a relay again. 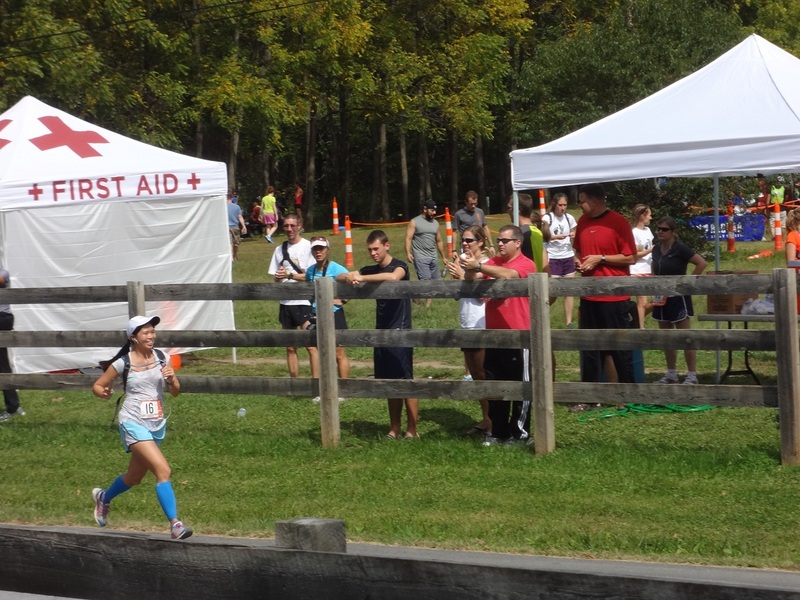 I enjoyed cheering on my teammates whenever possible, since it kept my mind off of being nervous for my own relay legs. I was proud of all of them for having fun and conquering the tough course! My first leg was 6 miles, and it went by quickly. There were rolling hills, but the residential scenery was quaint and interesting. It felt like running through a very quiet town, but most of the houses were on tree-lined roads. Bugs became a problem at the exchange points–it was super humid and there were so many flying insects! I remember being really tired by the time we ate lunch/dinner around 3:00pm at a small bakery-restaurant called Weaver’s. I ate a plate of fried food like onion rings, wings, mozzarella sticks and chicken tenders. I also got a small bowl of vegetable soup and lemon meringue pie. It wasn’t the healthiest meal, but it was what my body craved. I remember napping a lot in the van between 8-11pm, hours before my second leg because I was so tired from lack of sleep the night before. I felt bad for not cheering as much as I wanted to, but I needed to conserve some energy since my next two legs were a hilly 3.5 miles and a long 8.5 mile leg. I was dreading my second leg but also looking forward to it, just because it had such steep uphill climbs and I was going to be running around midnight in the pitch black rural wilderness. The only good part about it was that it ends at the South Mountain Creamery, one of my favorite places ever. They stay open during the nighttime hours to serve BBQ fare, fresh milk and ice cream to the runners! I dream about their fresh chocolate milk–so delicious. I gutted out my second leg, running/jogging the uphills and gritting my teeth when my legs were screaming at me to stop. I usually consider myself a strong hill runner, but it’s quite another matter running hills in the dark, on 2 hours of sleep from the night before, and trying to conserve some energy for another 8.5 mile run. I got passed by a few runners on this leg and we panted words of encouragement at each other as we trudged up the hills. When I saw the lights of the creamery I immediately cheered up. I handed off the slap bracelet/baton to Greg, and immediately thought of FOOD. I went straight to the dairy store to get apple pie ice cream and a quart of fresh chocolate milk. I love the glass milk bottles–it just makes the milk look THAT much more tasty. Deb got me a cheeseburger, and we went back to the van to drive off to the next exchange where we could sleep. I was so hungry at this point that I devoured the burger and ice cream, not caring if it would upset my stomach before I went to sleep. 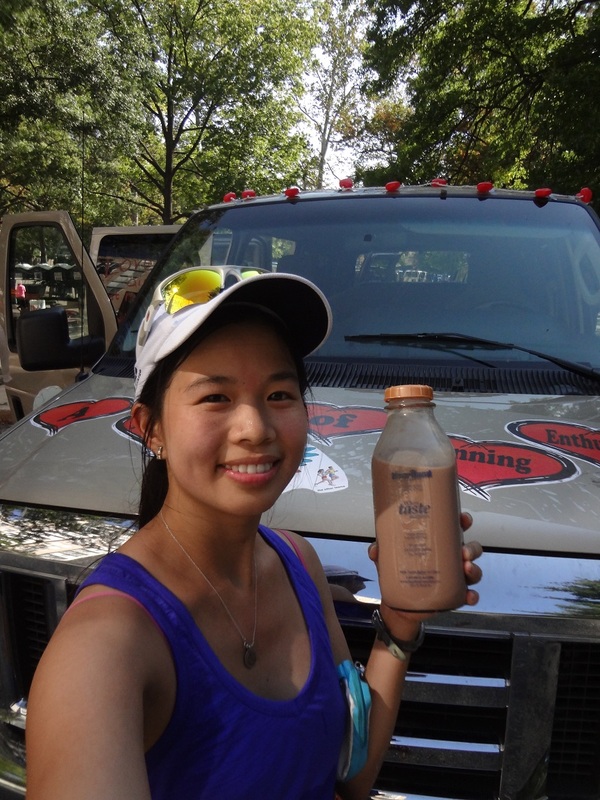 I kept the chocolate milk in the cooler for after my final leg, since chocolate milk is my favorite recovery beverage! We parked, slept for 3 hours, then woke up around 5:30 to meet Van 2 when they came by. No sooner than ten minutes after she said that, a Ragnar team van with a metal roof rack careened straight into the clearance gate, causing a sickening CRUNCH and ripping the gate off its concrete foundation. About forty other runners from various teams gaped on in shock, and unfortunately instead of helping, the first reaction of some people was to take pictures instead. Luckily, the people in the van appeared to be unharmed (although shaken up), and their windshield was cracked, but the glass didn’t shatter. I felt so bad for them–it was a crazy thing that happened, and I was unsure if the group ended up continuing the race after that catastrophe. I was just glad that everyone was ok, and people did assist them afterward and reported it to Ragnar race headquarters. This happened around 8:30am on the second day of the relay, pretty late in the game. One by one, my fellow compatriots in Van 1 completed their legs, and finally it was my turn to run my third and final 8.5 mile leg! Since I’m a distance runner, I didn’t mind the mileage, but I was still eager to be done. I ran through a beautiful urban park, a recreational trail, through a tunnel, and then finally through my friend Lauren’s neighborhood of Friendship Heights! It was funny that I recognized her neighborhood–unfortunately I didn’t meet up with her because of the brief transition period, but it was nice to see a familiar place because it meant we were near DC! I high-fived my teammates, and then took my time to finally enjoy my chocolate milk from the creamery and change into a clean Team A.M.O.R.E. t-shirt. Van 1 was done, hooray! 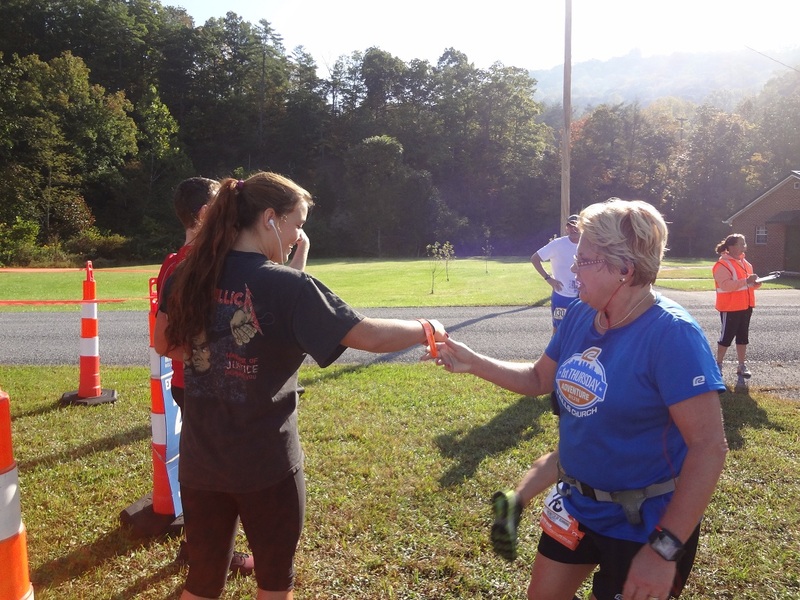 Finally, it was my favorite part–driving to the finish and eating recovery foods!! Is this a good recovery food or what? 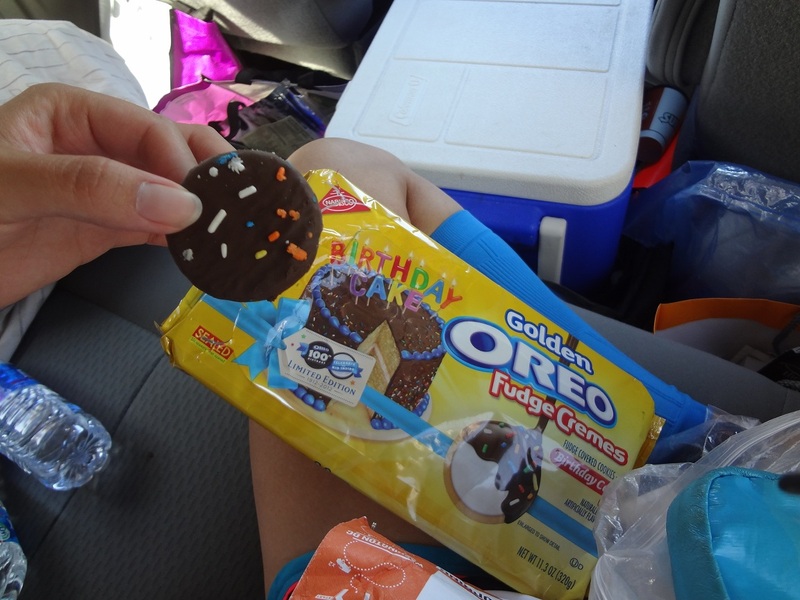 Diane brought the most amazing golden Oreo Fudge Creams and generously shared them with us. Thanks Diane! Too bad they are limited edition and were only available during the summer. We drove to National Harbor, met up with our wonderful volunteers Larry and Art, explored the booths, and headed to lunch at Cadillac Grill. At the finish festival, we got free cans of tea and Monster energy drink, and I purchased some cool Ragnar pendants from Scott James jewelry. I also ran in to a co-worker, Rob, who was running with another team from the nonprofit Back on My Feet! It was a serendipitous meeting because the finish festival runs so long! At the Cadillac Grill, we had friendly service and I dug into a plate of lemon chicken and some cheesy nachos. Yum! Around 3:00pm, both Van 1 and Van 2 of Team A.M.O.R.E. reunited at the finish to watch for our final runner, Derek to come through the finish line. The sun was shining, our team was grinning, and it just felt great to be a part of the whole thing. Finally, we spot Derek and we run through the finish with him, flip-flops and all. Congratulations team!! Our final result for this 197-mile relay was a time of 31:29:28. We placed 170/298 total teams, and 73/139 in the Mixed Open division. But of course, we were the #1 team with heart!! This year, voting for the annual personality awards took place via text message, and a few days later we learned that we won for Best Decorated Van! It means we get bragging rights, our name in the results book and Ragnar Facebook page, and individual baton awards! 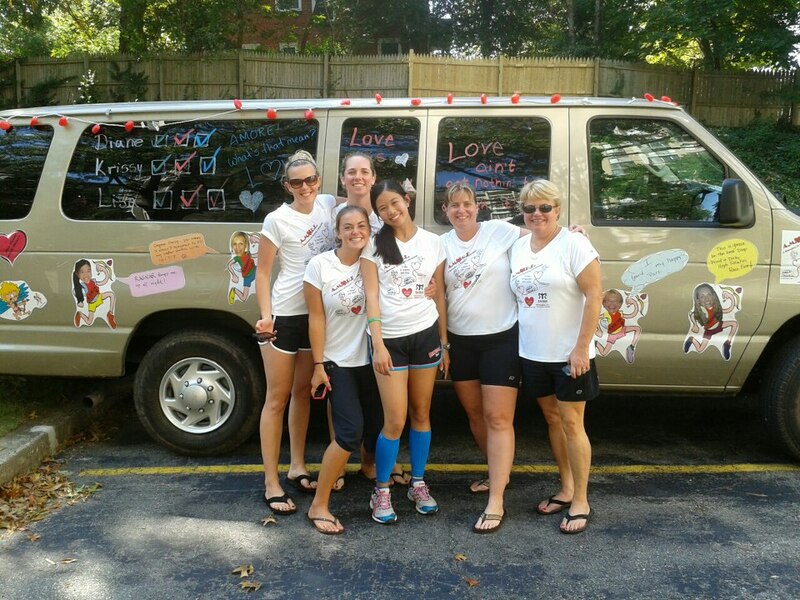 A huge thank you goes to Diane for being captain and designing the original caricatures of our runners on the vans. Also, thanks to my teammates Bea, Kate, Lance, Greg, Steve, Derek, Diane, Deb, Krissy, Catherine and Shannon for being so fabulous! I had a great time running with you all and I was so happy to be a part of this team. Last but not least, on Saturday evening Diane hosted a wine/champagne hour (thanks Shannon for the Chandon champagne!) and Chinese food eating festivities at her house. 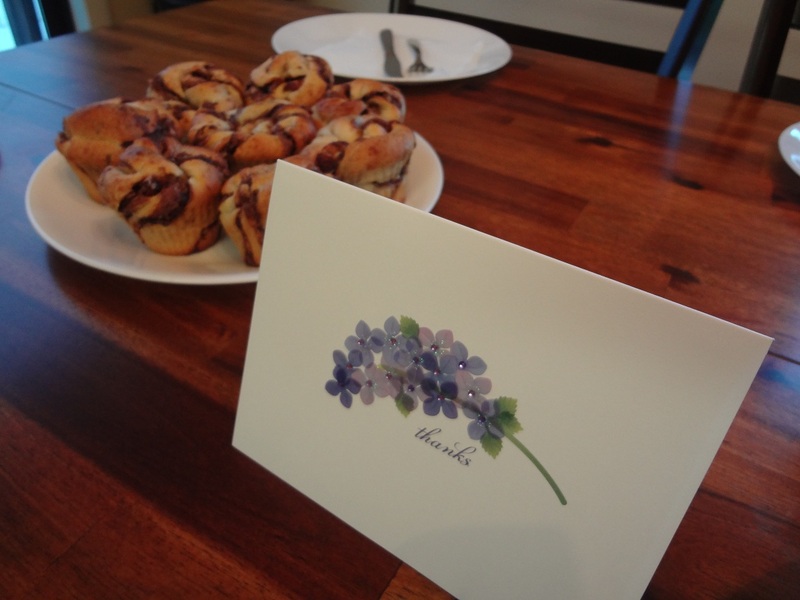 Then, she also woke up early to cook us a beautiful brunch complete with mimosas, breakfast sandwiches, eggs, bacon, sausage, hazelnut rolls, and sticky buns! Thank you Diane–you made us feel so special!! Before I left DC for good, Deb took me to Caribou Coffee to get an iced latte–I love their coffee. It was a great way to end a memorable weekend. I am truly a lucky person. 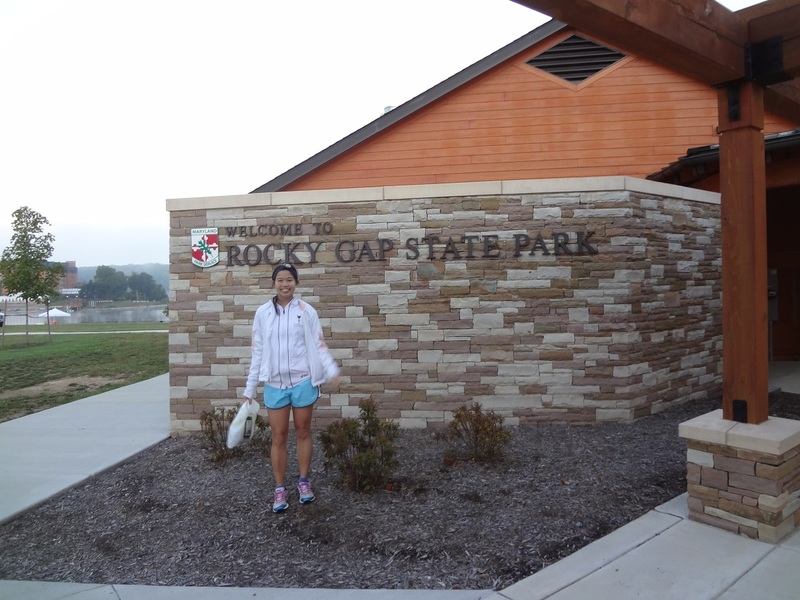 Categories: Uncategorized | Tags: exchange point, Ragnar Relay, Ragnar Relay Washington DC, Rocky Gap state park, running, team, Team AMORE | Permalink.